The Cape mountain zebra (Equus zebra zebra) is the smallest of the extant zebras and the most restricted geographically. Its broad black stripes are closely spaced on a pure white body. Overall it is stockier than the Hartmann's zebra, has longer ears, and has a larger dewlap. The Cape mountain zebra formerly inhabited all the mountain ranges of the southern Cape Province of South Africa. By 1922, however, only 400 were believed to survive. To counteract the continued decline, Mountain Zebra National Park was established in 1937 on acacia veld near Cradock, South Africa, but its small population of Cape mountain zebra became extinct in 1950. That same year reintroductions from nearby remnant populations began. Eleven animals were donated from a nearby farm in 1950, and in 1964 another small herd was added. By the late 1960s, the total Cape mountain population was only 140 but grew to 200 by 1979, with 75 percent of the animals in Mountain Zebra National Park . In 1984, the population was back to 400 head. Since then a few zebras have been reintroduced to the Cape Point Nature Reserve. The most diagnostic feature of mountain zebra is a square flap of skin or dewlap on the throat, best developed on males. 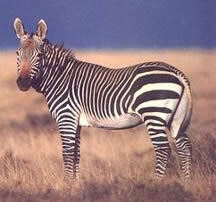 Mountain zebras never form the large herds characteristic of plains zebras, but do exhibit a harem-type social system. During the winter they move up to twenty kilometers (12 mi.) from a water source. With references to Cape Mountain Zebra in Caledon, Botrivier, the Langeberg, Witteberg, Swellendam, Riviersonderend as well as the George and Oudtshoorn mountains, it can be assumed with confidence that they occurred in all the mountains of the south-west Cape, with incursions to the plains at the base of the mountains at times. In an authoritative work on the Cape Mountain Zebra by Penzhorn (1988) he wrote: "Historically Cape Mountain Zebra occurred throughout the mountainous regions of the Cape Province of South Africa from the Amatola Mountains in the Cathcart District westward and northward to the Kamiesberg in Namaqualand." Historical records on the distribution of Cape Mountain Zebra often refer to claims by early explorers and authors that the Cape Mountain Zebra was the male and the Quagga the female of what they took to be the same species. This misconception in itself tends to confirm that the two species must have shared the same feeding grounds and to some extent confirms that the Cape Mountain Zebra's historical range was not restricted to mountainous areas, as is the case today. Skead (1989) writes as follows: "These zebras might never have gone far from the mountains, especially when the white man started colonising the country and taking over the zebra's grazing grounds, but this (ability to utilize flat country) would have been a precautionary measure enabling them to reach more inaccessible ground in the shortest possible time, a fact which may account for this species' survival against the true Quagga's extermination in the face of its inability to adopt to a mountain refuge." Studies of habitat utilization in the Mountain Zebra National Park at Cradock showed the versatility of Cape Mountain Zebras in utilizing all the available plant communities except riparian bush communities. In the same study, Cape Mountain Zebra showed a clear preference for grassland vegetation communities on the plateaux and dwarf shrubland communities with high grass biomass. During the dry season Cape Mountain Zebra showed a greater diversity in their use of plant communities and greater use of those plant communities on mountain slopes and in ravines. In the only study found on home range determination for Cape Mountain Zebra, Penzhorn (1982) found an average home range of 9,4 sq km for 16 breeding herds of Cape Mountain Zebra in the Mountain Zebra National Park.